The 10 Best Museums in North Dakota! North Dakota may be small, but it is huge when it comes to cultural opportunities. Whether you want to harken back to the days of the Wild West or immerse yourself in the beauty of the majestic badlands, North Dakota has a museum that will be right up your alley. The following museums are worthy of a visit on your next road trip. Operated by the State Historical Society of North Dakota, the State Museum is North Dakota’s largest. With interactive exhibits that include the “Adaptation Gallery: Geologic Time,” “Innovation Gallery: Early Peoples,” “Inspiration Gallery: Yesterday and Today,” and “Governors Gallery: Green Revolution,” the museum has a plethora of exciting opportunities to learn more about the state and its rich history. For those with small children, the State Museum has a special children’s exhibit area called The Treehouse. Your children will likely to be most drawn, however, to the life-sized casts of a Tyrannosaurus rex and a Triceratops engaged in battle. Did you know that North Dakota was, until recently, home to the area’s only white buffalo? Although White Cloud was moved to a private caretaker’s farm in 2016 due to her specialized needs, her legacy lives on through the museum. Not only are white buffalo considered sacred by Native Americans, local lore was that those traveling past the buffalo herd would receive a year of good luck if they could spot White Cloud. Even though the famous albino buffalo is no longer present at the museum, at least during the summer months, the museum still maintains 25-30 buffalo on their grounds. The Buffalo Museum’s exhibits focus on the history of the buffalo and the Plains Indians that were the original residents of the area. With a mix of artwork and artifacts, the museum tells the tale of life in the 19th century. The grounds are also home to the “World’s Largest Buffalo,” one of the best photo opportunities in the state. For the aviation buffs in your group, a visit to the Fargo Air Museum is in order. Home to aircraft from all era, including the Global Hawk unmanned reconnaissance drone and a highly-accurate recreation of the Wright Brothers’ flyer, the museum is a treasure trove of aviation artifacts, military memorabilia, and interactive exhibits. It is also home to the Midwest’s largest aviation library and an extensive gift shop. The Air Museum sponsors a variety of special events, so plan your visit accordingly. One of the largest museums in the state, the Plains Art Museum is a must-stop for anyone visiting the region. With an ever-changing myriad of exhibits, the museum combines historical artistic renderings with current artistic trends and interpretations. Housed in a renovated turn-of-the-century warehouse that is as impressive as the art it contains, a visit to the museum is exhilarating on multiple levels. In addition to the approximately 4,000 works that are a part of the Plains Art’s permanent exhibit, the museum hosts 12 special exhibitions each year, along with many smaller exhibits interspersed throughout. The Plains Art Museum is dedicated to the support of creativity within the artistic community and beyond. The Katherine Kilbourne Burgum Center for Creativity is a multipurpose art facility that hosts a selection of classes for everyone in the community. Another fabulous air museum in North Dakota is in Minot. The Dakota Territory Air Museum was created to preserve the state’s rich history in avionics. With a mix of famous military and vintage aircraft, the museum seamlessly connects the present to the past. Aircraft on display include military aircraft like the Douglas C-47 (DC-3) World War II Transport and the 1934 Stinson Reliant SR5-A and civilian aircraft such as the 1928 Waco 10 and the 1951 Piper PA-22 Tri-Pacer. The museum has also worked very hard to amass an impressive collection of photographs, literature, and periodicals related to aviation. As a bonus, the museum even houses Minot Fire Department trucks from the 1920s and 30s. Calling all cowboys and cowgirls. The North Dakota Cowboy Hall of Fame is where Native American history meets ranching and rodeo. The 15,000 square-foot building houses permanent and traveling western culture exhibits, a Hall of Honorees, theatre, gift shop, and a 5,000 square-foot open-air patio. From writer Louis L'Amour to “Great Westerner” Teddy Roosevelt, the Hall of Honorees is a virtual who’s who in North Dakota history. The museum is also a supporter/participant in Medora’s famous “Old Fashioned Cowboy Christmas,” which is held annually toward the middle of December. The event truly gives you the opportunity to step back in time and celebrate the holidays as they did in the Wild, Wild West. The Midwest was built around the railroad, and the North Dakota Railroad Museum pays homage to that history. Located on four acres of land in Northwest Mandan, the museum includes a wide variety of railroad related equipment, include a bridge, speeder shacks, a coaling bucket, tracks, and of course, train cars. The museum also includes a vast collection of literature and memorabilia. Plan to spend a good amount of time on the grounds. There is a lot to take in. The brainchild of local farmer and collector Paul Broste, the museum has been called the most extensive rock collection in North Dakota. In addition, Jake Jacobson, another local collector, donated a unique collection of Native American artifacts to elevate the quality of the museum even higher. Not only is the collection one of the best in the country, it is housed in a structure that is completely made of hand-cut, polished granite. To say that the rock museum was a labor of love is an understatement. Located in Grand Forks, the North Dakota Museum of Art is the State of North Dakota’s official museum. One of the largest art collections in the area, the museum features a deft combination of historical artifacts and contemporary art in a variety of mediums. The 16,000-square-foot building includes three exhibition galleries and a video information room. 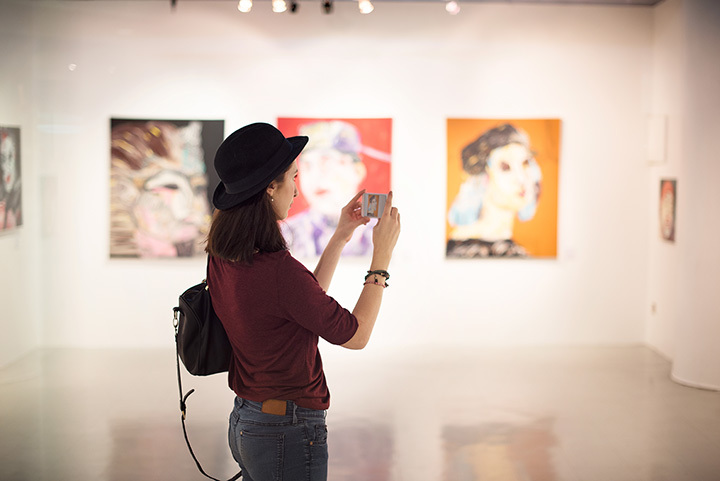 The museum also has an extensive education program that includes numerous art-related classes that are appropriate for budding artists of all ages and skill levels. Individual and group tours are available regularly.